The Bombardier CRJ1000 is a twin engine regional jet aircraft that is assembled by Bombardier Aerospace in Canada. The CRJ1000 is the largest CRJ series aircraft and is a continuation of the CRJ series design. As the largest CRJ aircraft, the Bombardier CRJ1000 is capable of carrying 100 passengers on regional routes. By looking at the aircraft you can see that it is a stretched version of the CRJ900 jet, however Bombardier has incorporated improvements into the CRJ1000. Bombardier markets the CRJ1000 as the Bombardier CRJ1000 NextGen aircraft to point out the improvements made in the CRJ series aircraft. Two General Electric CF34-8C5A1 turbofan engines power the CRJ1000 and are mounted on the rear of the aircraft. Range for the Bombardier CRJ1000 is around 1,640 statute miles for the main CRJ1000 aircraft. To learn more about the Bombardier CRJ1000's components and specifications visit the other specific CRJ1000 pages on the site. These articles are linked in the CRJ1000 menu that is located on this page. Above Bombardeir CRJ1000 Aircraft photo by Fabrizio Berni on Wikimedia Commons. Photo (only) released under the GNU Free Documentation License, Version 1.2. The Bombardier CRJ1000 was born out of a need for a larger regional jet in Bombardier's aircraft line that could provide good operating costs. On February 17, 2007 Bombardier officially launched the CRJ1000 with 61 orders. First flight of the Bombardier CRJ1000 prototype occurred on September 3, 2008 and the regional jet was certified by Transport Canada on November 1, 2010. The European Aviation Safety Agency (EASA) certified the aircraft on November 9, 2010. Lastly the Federal Aviation Administration (FAA) granted a type certificate (certified) the CRJ1000 on December 17, 2010. First Delivery of the Bombardier CRJ1000 aircraft took place on December 14, 2010. Air Nostrum and Brit Air both took delivery of the first CRJ1000 jets on that day. 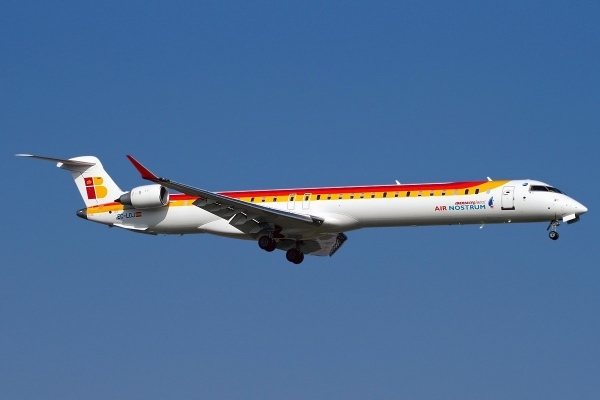 Currently there are three versions of the Bombardier CRJ1000. There is the EL, base, and ER version of the jet. The EL version has recently been added. The CRJ1000 EL has a lower range and shorter takeoff field length then the other two versions. The base version is the main version of the CRJ1000 jet. The ER version is an extended range version of the CRJ1000. Also note that Bombardier mostly designates/markets the CRJ1000 as the CRJ1000 NextGen, CRJ1000 NextGen EL and CRJ1000 NextGen ER. As of June 30, 2012, Bombardier has 70 total orders for the CRJ1000. 34 have been delivered, leaving 36 CRJ1000s on backlog. Like the other CRJ series aircraft, the Bombardier CRJ1000 has multiple other names. Sometimes the aircraft may be called the Canadair Regional Jet 1000. CRJX is the ICAO code for the aircraft and CRK is the IATA code for aircraft. Also the CRJ1000 official model name is CL-600-2E25, which is primary used by aviation regulators to identify the aircraft. To learn more about the Bombardier CRJ1000 jet visit the other CRJ100 pages with detailed information on specific areas of the CRJ1000 aircraft (to be posted shortly).